Thinking about his comment, I realized how much greed, selfishness, avarice and covetousness there is among all people. This is not only a sin of America, but a sin of the underprivileged nations of the world as well. No matter how much a person has or does not have, he wants more. Few people today can say as did the Apostle Paul, “I have learned to be content with what I have” (Cf. Philippians 4:11-12). It is significant how much Jesus spoke of money, although He had no personal interest in it. He had become poor that we might through His poverty be rich. He said, “Foxes have holes and birds of the air have nests, but the Son of Man has nowhere to lay His head” (Matthew 8:20). He carried no wallet. His physical requirements were simple. A meal of wheat plucked from the roadside and a mossy stone for a bed in quiet Gethsemane could fulfill His needs. To quench His thirst, He got a drink of cool water from Jacob’s well. His taxes were paid by gold taken from a fish’s mouth. Christ had no interest in and little need for money, but He had much to say about it. He knew that money represented blood, sweat and tears; and that our attitude toward it is an accurate gauge of our character and our sense of values. He knew that money could be a blessing or a curse. He knew that the love of it is the root of all evil, but that the proper use of it is a means of advancing His Kingdom on earth. He knew that money can be either a symbol of selfishness or a token of selflessness, depending on the way we use it. Many of Jesus’ parables had to do with stewardship of time, talent or money. He was tremendously concerned that nothing be wasted, but that every God-given commodity be used constructively. He spoke of the Prodigal Son, who spent his money in the wrong way; the foolish man who put it in the wrong place; the Pharisee who gave it with the wrong motive. He spoke also of a poor widow who gave as everyone should give. Over and over again, Christ mentioned money. Though His Gospel was spiritual, He had much to say about the material, because there is always a relationship between the two, paradoxical though it may seem. He said, “Render to Caesar the things that are Caesar’s, and to God the things that are God’s” (Mark 12:17). So grace and gold are inseparably bound up together; and as long as God’s Kingdom is upon earth, the need of earthly mammon is indicated and is closely tied to our spiritual life. Our Lord’s command was, “Give, and it will be given to you: good measure, pressed down, shaken together, and running over” (Luke 6:38). Yet it was more than a command. It was an invitation to glorious and abundant living. If we get our attitude toward money straight, it will help straighten out almost every other area of our life. The chief motive of the selfish, unregenerate person is to “get.” The chief motive of the dedicated Christian should be to “give.” There are clearly two philosophies about money. The first is Satan’s. He says to every man, as he said to Christ, “All these things I will give You if You will fall down and worship me” (Matthew 4:9). The second philosophy is Christ’s. “Sell all that you have and distribute to the poor, and you will have treasure in heaven; and come, follow Me” (Luke 18:22). The first is motivated by selfishness; the second, by unselfishness. The first has greed at the center; the second has God at the heart. The first has an eye for this world: the second has an eye for eternity. The first is slated for failure; the second, for success. Many Christians write to me, asking, “What is the Christian’s standard of giving?” Many people give by impulse or on the spur of the moment. They have no systematic way of giving their money to the work of the Lord. Others just toss a few coins or bills into the collection plate on Sunday morning as though they were tipping God. There are those who give as if they were doing God a big favor. Some give only when times are good and their bank account is running over. Then a little of the overflow is scraped off and given to God. The Scripture teaches that we are stewards for a little while of all we earn. If we misuse it, as did the man who buried his talent, it brings upon us the severest judgment of God. The tithe is clearly taught in the Old Testament, and Jesus said to the scribes and Pharisees regarding the tithe, “… these [justice, mercy and faith] you ought to have done, without leaving the others [tithing] undone” (Matthew 23:23). The tithe is the Lord’s. If you use it for yourself, you are robbing God. The New Testament goes beyond the Old Testament and teaches that we are to give as God has prospered us. We are to take the tithe as a standard, but to go beyond the tithe as an indication of our gratefulness for God’s gifts to us. One of the worst sins that we can commit is that of ingratitude. In the midst of sorrow and trouble, this life has many blessings and enjoyments that have come from the hand of God. Life itself, preservation from the dangers to which life is at every instant exposed, every bit of health that we enjoy, every hour of liberty and free enjoyment, the ability to see, to hear, to speak, to think and to imagine—all this comes from the hand of God. Even our capacity for love is a gift from God. We show our gratitude by giving back to Him a part of that which He has given to us. The Apostle Paul said concerning this matter of giving, “But this I say: He who sows sparingly will also reap sparingly, and he who sows bountifully will also reap bountifully” (2 Corinthians 9:6). The Scriptures also have much to say about the motive in giving. Paul said, “Let each one give as he purposes in his heart, not grudgingly or of necessity; for God loves a cheerful giver” (2 Corinthians 9:7). We are to give cheerfully and gratefully to the work of the Lord. 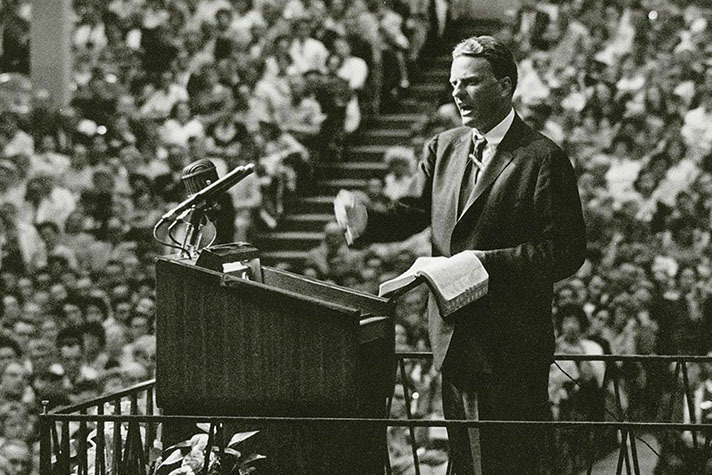 If every Christian were giving “as he purposes in his heart, not grudgingly or of necessity,” but cheerfully as God has prospered him—there would be more than enough to advance the Kingdom of God in this most critical period of human history. Malachi the prophet warned, “Will a man rob God? Yet you have robbed Me! But you say, ‘In what way have we robbed You?’ In tithes and offerings” (Malachi 3:8). Jesus said, “Take heed and beware of covetousness, for one’s life does not consist in the abundance of the things he possesses” (Luke 12:15). The greatest blessing of giving is not on the financial side of the ledger but on the spiritual side. You receive a sense of being honest with God. You receive a consciousness that you are in partnership with God—that you are doing something constructive—that you are working with Him to reach the world for Jesus Christ. You are also enabled to hold on to this world’s goods loosely, because the eternal values are always in view. Your readiness to give to the work of Christ is a solid witness to your love for Christ. If we are not willing to deny ourselves money, which is a part of ourselves, how can we be so bold as to say that we have surrendered our all to Christ? How do you give? Is it liberally and cheerfully? Or is it sparingly and grudgingly? If you have been giving God the leftovers of your belongings and your life, you have been missing the true joy and blessing of Christian giving and living. Wise is the person who lays up for himself treasures in Heaven, where moth and rust do not corrupt, and where thieves do not break through and steal. Your life and substance, invested in the work of God, will pay dividends throughout eternity. But most of all Christ wants you, and when He has you, He will have your wallet, your bank account, your stocks and bonds. Have you given yourself to Christ? He died on the cross and shed His blood for your sins. Now He demands that you repent of your sins and receive Him as your personal Savior, presenting your body as a living sacrifice unto Him. He wants your total personality—all your talents, time and possessions belong to Him. You are a steward, and you owe to God everything that you have. I am asking you today to give Him your heart and all that you have. Surrender to Him and ask Him what He would have you to do.